How much to tip movers might be the last problem to deal with after a day of stress-inducing and crazy-making situations; especially if you just finished a cross country move. You do not want to do is go into your moving day with no idea what the protocol is for tipping movers. The end of the day could go something like this: The movers only have a few things left in the truck and the moment comes that you have been dreading. Panic sets in, sweat forms on your brow, and your heart starts to race. Yup, it’s time for the tip! No one wants to look cheap or unappreciative, but you don’t want to over tip either. Not that the movers would mind, but you are probably on a budget. Do you give it to one person and let them divide it or hand each person a tip individually? This guide should help you through that stressful moment when it comes. Do You Have to Tip Movers?! You might be saying, “Tip? What tip? Don’t they get paid an hourly wage?” Well, yes they do, but so does the casino dealer who deals you a straight flush and the valet person who drives your car a whopping 100 feet to you. Movers are included in the service industry and tipping is the way to show your gratitude. 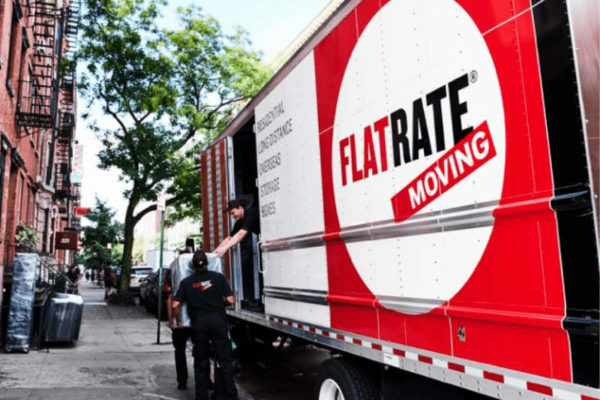 There is a reason that moving companies, like FlatRate, provide such a valuable service. They are doing something you absolutely don’t want to do. You may not even be capable of doing it. Moving is back-breaking work. Every day, they risk injury. They go home sore, and do it all again the next day. They move in the bitter cold while you watch from inside a toasty window, and they move in the hottest conditions when no one in their right mind should be away from an air conditioner. If anyone deserves a tip, it’s your movers. And the timing of the tip is key. You might want to drop a $10 bill on each guy at the start of the move, giving them incentive to work harder. Then, if they do a good job, add on some additional funds at the end of the day. One important note: make sure that your moving company is not adding a service charge onto the bill, as that would most likely cover a tip. You want to reward these guys for doing a good job, but you don’t want to double tip. It is a super-rare situation, but it never hurts to explicitly ask your mover whether that is the case. Now we get to the nitty gritty details. Calculating how much to tip movers is, like any other service situation, based on the total amount you are spending and the quality of the move. In most cases, a 5 percent tip is pretty standard. Some say 5 percent of the bill should be given to a foreman for him to split amongst the crew. Others argue that 5 percent is more appropriate per mover. This is merely a common suggestion. Many others advocate for 10, 15 or 20 percent. How much to tip movers depends on your level of satisfaction with the job and how much the job added up to. You might be thinking that 5 percent is not nearly enough for the amount of work they just did. If they moved the contents of a 5-bedroom house across town in 8 hours, with no breakage and minimal fuss, you are probably right. You can open up your wallet for that one. Sometimes, you have to use your best judgment. However, on average, most movers don’t expect more than 20 percent, but, after a day of hard labor, they certainly appreciate it. And would not turn their noses up at it. Of course, there is an exception to the basic guide: long distance moving. In most cases, the only difference between a $2,000 move and one that costs $20,000 is distance. Long distance movers are generally tipped according to the number of days. Many suggest that a cross-country move of four to five days deserves around a $200 tip. However, if they drove two days though the most horrible weather conditions, and managed to not end up in a ditch like cars around them, maybe they deserve a little more. Beyond just long distance moves and the vagaries of the weather, what these crews are moving is important as well. If you have multiple flat screen TVs and thousands of dollars in computer equipment that must be handled delicately, you might want to do something extra special on the tip. That also applies if you have loads of heavy, antique furniture. Or movers that navigated 4 flights of stairs in a cramped New York apartment building with no service elevator. So my last move cost me $400 (within the city a few miles) and I tipped the 2 guys (who were quite fabulous and fast and nothing scratched) $100. They were like WOW. Nice to make someone’s day. Moving furniture is a tough way to earn a living and generally the guys doing the work don’t make a fortune. The only job I know of that is more physically demanding is being a mason’s helper. If the crew is hard-working, friendly, pleasant and accommodating and you’ve got a house full of fine furniture that they take good care of then tipping is entirely appropriate; maybe even an obligation. What If I Don’t Want To Tip my Mover? Tipping movers is just like compensating any other service worker. Not every mover deserves a tip. Based on the quality of the move, the temperament of the workers and how much of your stuff is intact at the end of the day, you can feel free to tip or not tip. If you have a team show up late, trample your shrubs in front of the house, scuff the walls, use profanity in front of your kids, break your TV because they were tossing things around, and take a dozen cigarette breaks, then you probably shouldn’t tip them. Everyone has heard a moving horror story. The cousin who showed up at his new house and had movers demand an extra grand just to open the truck and release his furniture. The clumsy crew that shattered Great Aunt Edna’s gold-rimmed vanity mirror, the one that has been in the family for generations. Those are obvious no-tip situations. All that being said, if you read reviews and hire an established company with a great reputation, you shouldn’t be in this position. In situations like that, where the movers performed well below expectations, you should bring up your dissatisfaction with the foreman/driver. Whoever is in charge. If they are unwilling or unable to rectify the situation, then you should follow up with a customer service rep at the home office. You may assume you need to tip the crew leader more, but you don’t, unless they were visibly doing significantly more work than the others. Keep in mind that their hourly wage is likely higher, too. If one person on the team really worked a lot harder than the others tip everyone individually, so you can give the hardest worker more. If you are going to give them one amount to split, hand it to one person in front of the others and make it clear that it is to be split, so it doesn’t end up only in one pocket. If that makes you uncomfortable, you could just hand a separate amount to each individual worker, to make sure everyone gets the correct amount of cash. It is nice to provide your moving crew with some refreshment. Just like tipping movers, this is not mandatory, but a pretty decent gesture nonetheless, given that these guys just hauled all your stuff up and down stairs and across town. On hot days, hand out some bottles of water and maybe grab a pizza for lunch. Stay away from beer, though. Most companies likely have a policy against the crew drinking during or after a job. And the possible liability on your end is not worth it. You could end up on the hook if the crew takes to your beer offer too vivaciously and ends up causing some disturbances down the line. If your move is during the winter months, pick up some coffee or hot chocolate for the crew in the morning. They will appreciated the gesture (almost as much as a tip). Some might want to buy lunch and liquid refreshment instead of a cash tip. That may be a fine practice, especially if your move is relatively small. But probably best to stay away from cheaping out like that if you move involves more than one bedroom or an arduous journey. How much to tip movers can be a vexing problem. The common wisdom is not as standard as tipping waiters and waitresses. But the guide above provides a wealth of perspectives and advice for getting through the social minefield with your wallet and sanity intact. Now that you’ve been primed on how much to tip movers, it’s time to get moving! Start here to get a no-hassle, no-obligation price quote.